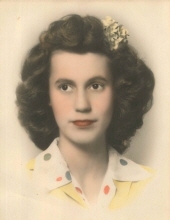 MARTHA JEAN PARKER, of Eureka Springs, Arkansas, was born October 13, 1927 in Little Rock, Arkansas, daughter of Robert and Allie Mae (Tanner) Carver. She departed this life February 5, 2019 in Eureka Springs, at the age of 91 years. Martha enjoyed crocheting and loved having lots of different friends in Eureka Springs come to visit her. She is survived by three sons, Charlie Parker and wife, Noni of Ventura, California, Gary Parker of Eureka Springs, and Ronnie Parker and wife, Roxie of North Little Rock; four grandchildren, Ali Campbell and husband, Michael, Heather Galbraith and husband, Michael, Cory Parker and wife, Heather and Tara Smith and husband, Scott; six great-grandchildren, Jacob Campbell, Jacy Campbell, Jordan Campbell, Peyton Galbraith, Nicholas Galbraith and Nichole Smith; Mary Beals of North Little Rock; several nieces, nephews, other relatives and many friends. On March 31, 1950, she was united in marriage with Charles Lewis Parker, who preceded her in death. She was also preceded in death by her parents. Graveside service will be held on Friday, February 8, 2019 at 2:00 p.m. at the Bethlehem Cemetery in Joan, Arkansas. Online condolences may be sent to the family at nelsonfuneral.com. © Nelson Funeral Service, Inc. 2019. To send flowers or a remembrance gift to the family of Martha Jean Parker, please visit our Tribute Store. "Email Address" would like to share the life celebration of Martha Jean Parker. Click on the "link" to go to share a favorite memory or leave a condolence message for the family.